I came across this verse during my Bible study devotion today. I especially liked the wayThe Living Bible put it. It reminded me of when I was a very young person and also a new Christian. The teachings I heard preached at the church I attended weighed a bit heavy on the legalistic end, and light on the end of grace. I tried very hard to follow all of God’s commandments to the point I was quite legalistic with myself, but there was a part of me that was pretty judgmental of others. I often privately compared myself to people who I did not feel were as “together” in following God’s Word, yet I myself was not really studying His Word. I just caught a bite of it here and there from Bible studies and such. On my own, I rarely cracked the Bible open. Today, I am much more familiar with the Bible and enjoy my daily devotion. Life has taught me a lot in all the years since then. Though I don’t think I had an evil eye per-say back then (as described in verse 23), I did have a problem with pride, and did not really understand what grace was. In that sense, I could so identify with the second half of verse 23. While I ‘thought’ I looked at the world with eyes full of light, I was fooling myself, and was really looking through the darkness of judgmental eyes. Those prideful eyes were hindering me from seeing God’s true love, grace and truth. May you give us all your eyes to see with, and not just our own. Open our eyes Lord. 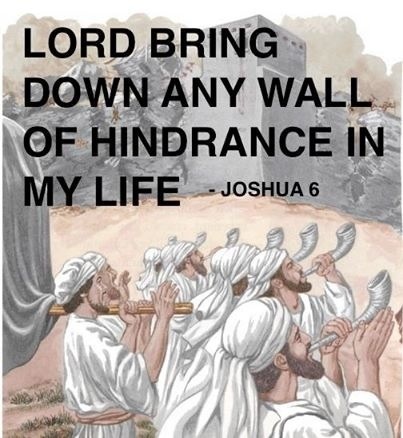 Bring down any wall of hindrance in our life. In Your name Jesus, Amen. We often kid ourselves into thinking we are doing so well, when in fact we need major improvement.